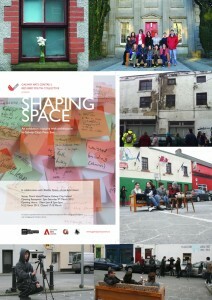 Red Bird Youth Collective in collaboration with Blaithin Quinn (artist and architect) present ‘Shaping Space’, an exhibition about architecture in the West End of Galway city. This project is funded by The Arts Council of Ireland’s ‘Engaging with Architecture Scheme’. Emphasis is placed on encouraging the public to engage with Galway’s architecture, with the aim of increasing awareness and appreciation of the built environment. ‘Shaping Space’ will also feature a walk and talk event: a member of Red Bird will guide the public through the West End and explain how aspects of local architecture inspired the show. This Walk/Talk will take place on the 16th March at 2pm, beginning at Nun’s Island Theatre. Red Bird explores a variety of media in this exhibition to create individual responses to the built environment. The eleven participants have created artworks that are directly informed by the architecture of Galway’s West End. The works include a sound piece evoking the ambient sounds of the area, an interactive game about local architecture, documentation of an outdoor living room and a photographic piece about the Nun’s Island Theatre building. The artworks were made during a workshop series facilitated by Quinn, a space where discussion and experimentation was encouraged. Quinn is an active practitioner in the emerging field of public engagement with architecture. She employs contemporary visual art strategies to open up a public dialogue with architecture. Her recent group shows include the international ‘Dublin Biennial’ and commissioned works for ‘Unfolding Narratives’ and ‘Peripheries: Art by Proxy’. Quinn was recently commissioned by the Irish Museum of Modern Art to design and deliver a workshop for Open House Dublin. Her upcoming exhibitions include a show in New York in Spring 2014. Red Bird Youth Collective was founded in 2011 by Galway Arts Centre as an arts group for young people living in Galway City and County. Participant’s ages range from sixteen to twenty four and their interests include film, theatre, literature, design, photography and music. Red Bird aims to encourage and support creativity for young people in the Galway City and County region. To date the group’s accomplishments include an exhibition entitled ‘Sample’ in collaboration with Louise Manifold, which took place in Galway Arts Centre in 2012. After ‘Shaping Space’ Red Bird will screen their original film ‘Belong’ on Sunday 24th March at 2pm in Nun’s Island Theatre. The group wrote, filmed and edited the film with visual artist Jonathan Sammon and special effects technician Ruadhrí Brennan under the ‘Youth Ensemble Scheme 2012-2013′, also funded by The Arts Council of Ireland. Exhibition event: Walk/Talk will take place on the 16th March at 2pm. Meet at Nun’s Island Theatre. Exhibition runs until the 22nd of March 2013 open Monday to Saturday from 10 am to 5.30 pm. Closed 17th and 18th March.